You see some strange things at the beach. Today was not very hot but sunny, about 19°C, and there were quite a few people on the beach, playing games, swimming or just sitting in the sun. Then there was this guy. He was clad completely in black, jeans, t-shirt, boots, leather jacket, all black. He was alone, flying a kite, and I guessed that he might have come to the beach by motorcycle. I didn’t see any motorcycles parked nearby though. 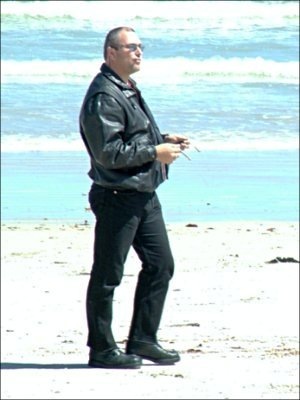 This entry was posted in Photos, Thoughts and tagged Beach, biker, black, leather. Bookmark the permalink.